monumental is partly a live, updated performance of their 1997 debut album, F#A#∞, by the Montreal band, Godspeed You! 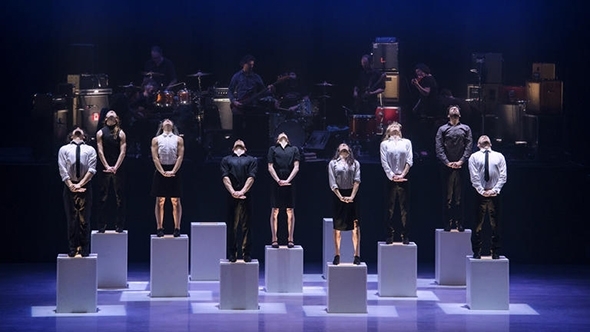 Black Emperor and partly an integrated response by the dance company, Holy Body Tattoo. The stage is divided between a raised platform with an array of instruments and amplifiers for the nine musicians and, in front of it, pedestals of varying heights for the nine dancers. The musicians create a wall of sound with electro-acoustic strings, tape loops and a vibrant percussive section that sounds somewhere between a revolutionary anthem and a lament; its dissonance refers to a view of society as a cancer but the romantic swell of its key progressions carves out a place for emotional resistance. The choreography, originally by Noam Gagnon and Dana Gingras but restaged recently by Gingras, expresses the affect of a cancerous society as anxious compulsion. It is the combined forces of music and choreography that create this monumental ode to an ever-present moment. The music was recorded at the approach of the millennium while the original choreography was created post-9/11 in 2005. A lot had happened in those intervening years to dash the promise of a new century and unleash violent socio-political forces from which the world is still reeling. In the monologue from the album’s opening The Dead Flag Blues guitarist Efrim Menuck intones, ‘The car’s on fire and there’s no driver at the wheel. And the sewers are all muddied with a thousand lonely suicides. And a dark wind blows. The government is corrupt and we’re on so many drugs with the radio on and the curtains drawn. We’re trapped in the belly of this horrible machine and the machine is bleeding to death…’ It’s a dark, dark place but it’s not so hard to distinguish its outlines on the current geopolitical map even from the comfort of our seats in the Barbican Hall. Raised on their pedestals in Marilène Bastien’s black-and-white city outfits the dancers play constantly with their corporal and psychological equilibrium in an environment of competition and insecurity. They are physically isolated from one another, enacting their individual psychoses in the form of frenetic tics and gestures, but also acting like a small society, calling out commands, shouting at and cussing each other and stamping their feet in unison. Caroline Gravel is the first to lose her footing; it appears at first to be accidental but the slipping and getting up becomes an entropic motif that permeates the group until the tension they have accumulated atop the pedestals drops to the floor and dissipates. It’s as if they have all descended from their high-rise offices to gather for a drink but although there are now opportunities for contact and support their underlying anxiety creates a pandemic of social chaos and disorder instead. Fights break out, individuals are ostracized and threatened and balance is overthrown; it is the sheer physical exertion of the dance that communicates the affect of the crisis we are in, bringing out the element of despair that underscores the music. As the level of commitment ramps up between musicians and dancers the emotional apotheosis of monumental reveals itself paradoxically in a stage littered with spent bodies while three dancers with searchlights reveal the havoc. Over a recording of Menuck’s opening monologue the dancers take stock and turn to the audience, kneeling on the front of the stage to deliver a message of hope but words fail them; their angst has consumed any possibility of reconciliation. One by one they fidget quietly and disperse leaving Neil Sochasky as the last dazed inhabitant of an emotionally exhausted landscape; the formidable energy of monumental has been entirely transferred to the audience.